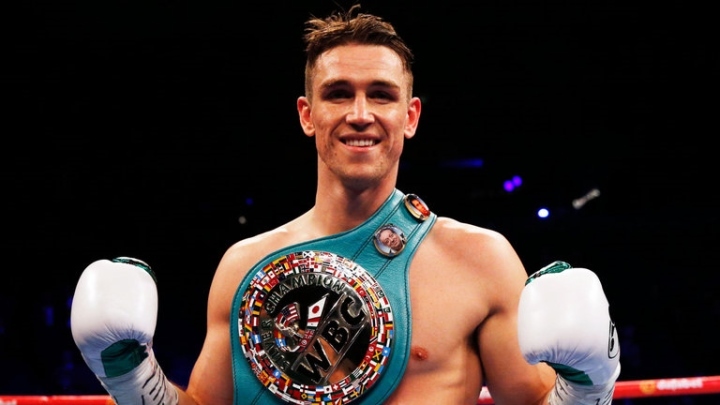 Callum Smith will be back in the ring sooner rather than later. The unified WBA Super, WBC Diamond and Ring Magazine super-middleweight world champion has been out of action since last September. Smith dethroned George Groves at the King Abdullah Sports City Stadium in Jeddah, Saudi Arabia, to win the World Boxing Super Series tournament. And after the 28-year-old became a father for the first time in January, it has been revealed that he will return to the squared circle on June 1. ‘Mundo’ has been confirmed as an addition to the supporting cast of Anthony Joshua’s WBA Super, WBO, IBF and IBO world heavyweight title defence against Jarrell Miller at Madison Square Garden in New York, exclusively live on Sky Sports Box Office in the UK and DAZN Stateside. His promoter, Eddie Hearn, sees Smith’s second American showcase as just the tip of the iceberg in terms of his potential across the pond. “There’s a lot of chat about the UK and America, but there are some massive fights in America for Callum Smith,” he said. “You’ve got the likes of [Saul] ‘Canelo’ [Alvarez], [Gennady] Golovkin, Julio Cesar Chavez Jr., Danny Jacobs, so June 1 is all about building that foundation. Kell Brook, Josh Kelly and Joshua Buatsi will all feature on the undercard of ‘AJ’s’ next fight, while former Derry Mathews opponent Tommy Coyle is expected to face Chris Algieri and Katie Taylor could be on in a fight for every lightweight title against WBC champion Delfine Persoon as she looks to add that belt to her collection of WBA, IBF and WBO crowns.